Scones and bran muffins have something in common: they often make a bad first impression. Indeed, my first scone experience was over 10 years ago, and I’ve avoided them ever since. I had no intention of ever baking a batch, but a series of events made me reconsider. First, I saw this post at Lisa’s blog, which peaked my interest. 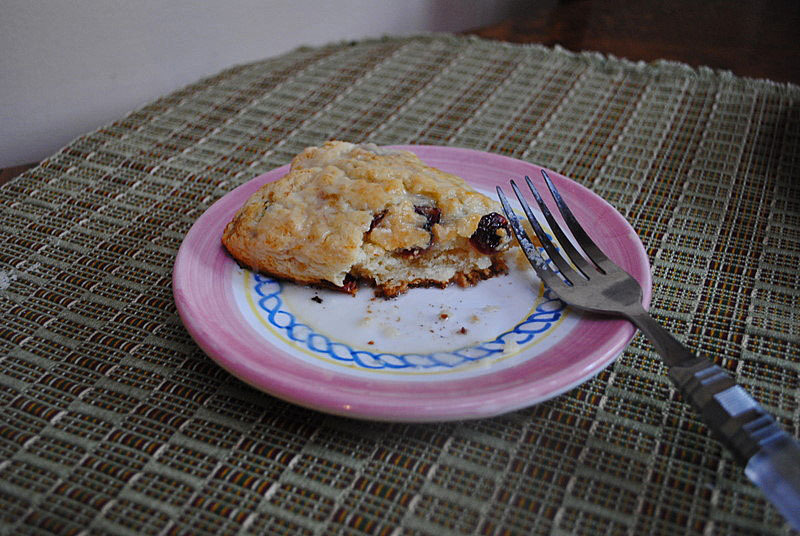 Then, a few days later some friends raved about banana scones from the latest Fine Cooking. Any hope of removing scones from my mind were shattered when I asked Phil what I should make for our Saturday post-run breakfast? “How about some blueberry scones?” …was his response. The path of least resistance was beckoning, and I veered that way. In a large bowl, whisk the flour, sugar, baking powder, lemon zest, and salt. Rub the pieces of butter into the flour mixture using your fingers until a few pea-size lumps remain. Stir in the banana and the dried fruits. Add the cream and stir the mixture with a fork until it comes together. Turn the dough onto a lightly floured surface and pat gently into a 7-inch circle about 1 inch high. Cut the dough into 8 wedges. Transfer to a baking sheet lines with parchment paper, allowing 1 inch of space between the scones. Brush the tops with heavy cream and bake until the tops are golden and they feel firm to the touch – 20 to 25 minutes. Cool slightly on a wire rack before glazing. To make the glaze, mix the confectioner’s sugar, lemon juice, butter, and salt, stirring until completely smooth. 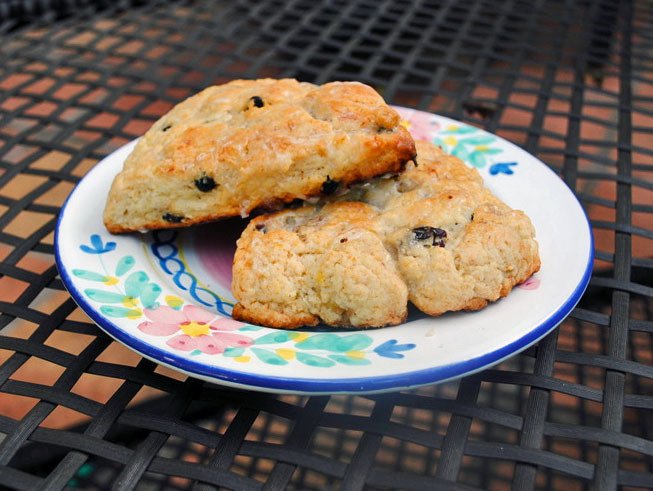 Drizzle the warm scones and serve them warm or at room temperature. Comments: The original recipe called for bananas and crystallized ginger. I’m insecure about changing baking recipes, especially the first time making them. However, being married to an incorrigible optimist helps a lot. ” Just skip the ginger and add the blueberries, it will be fine.” As I was preparing the ingredients he dug out a bag of dried cranberries and handed it to me: “…here, add these babies too, they’ll be some awesome scones”!